Miss Magooz Jewellery: Back in Action! Hello readers! I'm Robin, Meghan's friend, beading buddy, and time-to-time partner-in-crime! Meghan has admitted that she's hopeless at keeping up with her blog, and seeing as it's getting close to Christmas time and there a LOT of exciting shows coming up, I offered to step in and work to bring everything up to speed, and share some of what we've been working on! 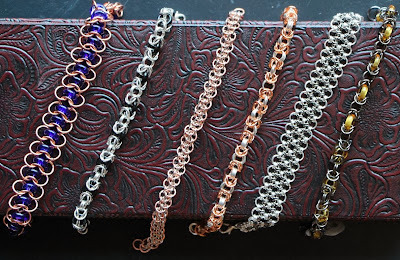 Both of us have been crafting up a storm for the oncoming shows, but lets take a look first at what Meghan's been spending the most time on - Chainmaille! 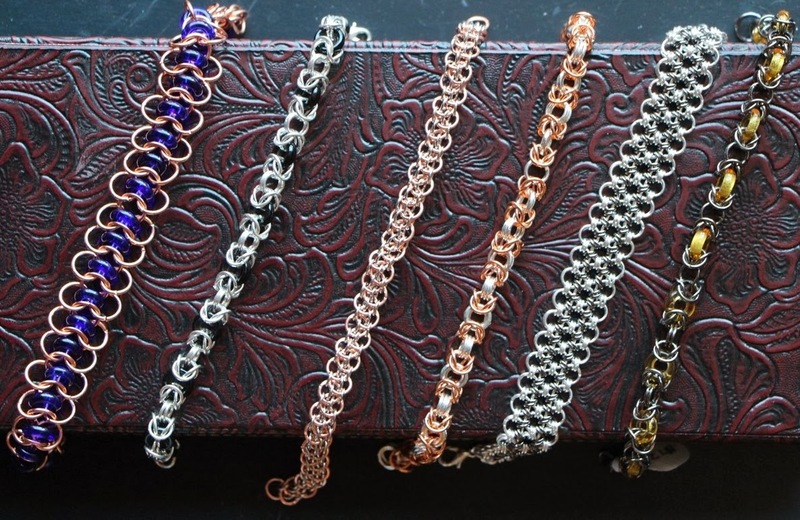 The best thing about chainmaille is how diverse the possible designs are, a bag of rings can become just about anything from a bracelet to a watch band! Check out some of her most recent work! Check out these beautiful necklaces! Different sizes and gauges of rings are combined to make various shapes, angles, textures and focal designs. From sweet and dainty weaves to bigger bib-style necklaces, anything is possible! Top to bottom we have a byzantine bouquet, a lovely silver and gold piece with a triangular focal weave, a fun mixed metal necklace with byzantine and helmsweave elements, an awesome reversible copper and silver necklace, a fun and funky gunmetal piece, and a sweet silver and copper necklace! No two the same, and a little something for every taste. Next, let's take a look at some bracelets! Glass "donut" beads can be added to chainmaille weaves to add some colour and fun, like in the first, second and last of these beauties. We also have three different byzantine bracelets, the weave is the same, but the colour combination makes each of these bracelets unique. The third bracelet pairs silver and copper rings in a fun zig-zag pattern, and finally, the fifth showcases a fun, floral weave in silver and gunmetal! 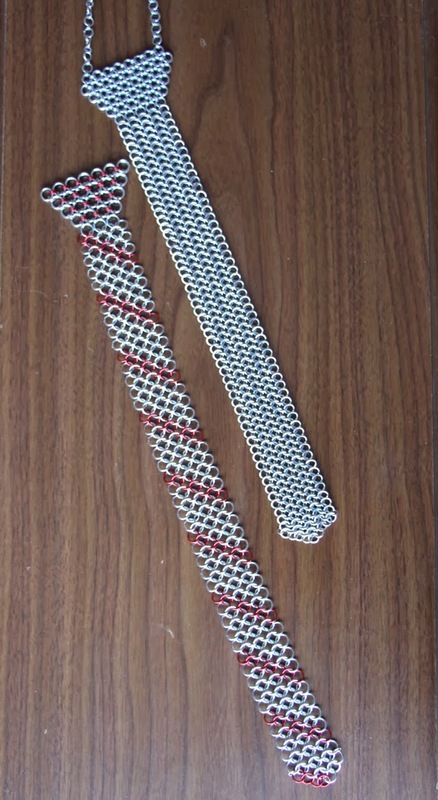 Finally, chainmaille is so versatile that not only can it be made into armour, but it can also be used to make stylish accessories for the modern man - check out Meghan's awesome chainmaille ties! 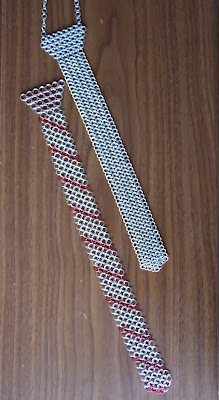 The use of aluminum rings in these unique ties makes them so light you barely notice they're there, and they make a fun conversation piece - who needs silk? 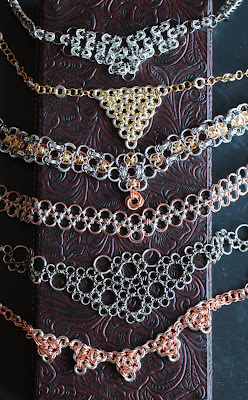 There are many more amazing, fun, funky, sleek, and stylish chainmaille pieces in Meghan's collection, and quite a few in mine as well! That said, there is also SO much more, stay tuned for another peek into the collection!